Finding minimal holiday decorations isn't always the easiest. Let's face it, this is not a season known for restraint! As my own decorating tastes are turning ever more minimal, I decided to take a cue from my favorite design style and make a few DIY Scandinavian-inspired ornaments. I just love how simple and natural this look is, while still being festive. Keep reading to see how to make all three decorations so you can style your own minimal holiday tree! A few weeks ago I took a woodworking class to familiarize myself with some new power tools. The class involved making a simple wood cutting board, much like this one. I was so excited with how mine turned out, and with how quick it was to make! Since it's the holidays and everyone could use a little help coming up with gift ideas, I'm sharing this DIY wood cutting board tutorial with you today. Keep reading to see how to make this thoughtful and special gift! The other day a friend told me about her family's tradition of getting their Christmas trees the day after Thanksgiving. While other people are feverishly chasing Black Friday deals, they spend the morning at a nearly-empty Christmas tree farm, cutting down fresh Christmas trees. Sounds pretty ideal, doesn't it? With proper Christmas tree maintenance, they don't have any trouble keeping them looking good for a whole month, so here's what you need to know to buy a real Christmas tree, and keep it in tip-top shape throughout the holidays. Ready for a fun before-and-after project? 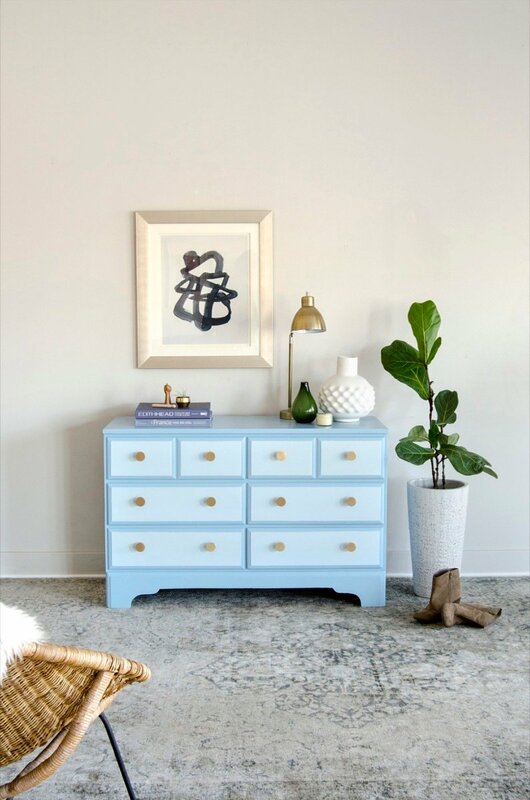 A boring Craigslist dresser is transformed into a vision of blue beauty, in just 10 steps! There is a right way to to achieve a great finish on a painted dresser, and there is certainly a wrong way, too. Sure, you could just slap on a coat of paint and call it a day, but impatience and rushing through the repainting process means sloppy results. However, we're here to share our careful step-by-step process, and to make sure you get it right the first time around so your Craigslist finds can shine! I live for a great trash-to-treasure project. And this piece literally came from the trash. I wasn't intentionally dumpster-diving, but one of our neighbors in the building was moving out, and leaving a lot behind. While taking out the garbage, I found a plastic case that had a lovely blue typewriter inside (immediately snatched that up), a squeaky office chair (I left that behind), and this ratty old seat. I went back and forth about whether or not I wanted to take the time to spruce it up. Usually furniture refinishing projects take way longer than I expect them to, but the opposite was actually true this time around. My little dumpster chair only took a half a day to refinish, and thanks to the right tools and attachments, I was able to paint and reupholster this little treasure with no trouble. Okay, show of hands... How many of us have sat down with chalk in hand in front of our new DIY chalkboards, ready to start lettering, only to realize that our chalkboard lettering skills stink? This morning at about 4:30am while I was surfing the webs --because that's what I do when I wake up waaaay too early and I don't want to get out of bed and my iPhone is within reach--I spotted a genius tutorial on Indie Craft Parade that shows how to letter like a total pro. Inspired, I started digging - and today I'm sharing three great tutorial for chalkboard lettering that'll make it seem like you went to calligraphy school. My husband designs video games for a living, and over the years, I've realized that video game design and interior design actually have a surprising amount of overlap. Room designers and game designers are both designing experiences for people to interact with, and though they may have very different end goals, some of the principles are the same. As fun as jewelry is to collect and wear, it can be tricky to figure out how to store all your pieces. If you're not careful, it can too easily turn into clutter. Home organization stores would love to convince you to run out and spend tons of money on jewelry organizers and storage. But if you're willing to get a bit crafty, you can easily make your own DIY jewelry organizer or holder to store your jewelry in style. Wood bead garland is receiving a lot of love at the moment, and for good reason! It introduces texture and interest, but is neutral enough not to clutter your space. It's suitable decor for minimalists and maximailists alike! One way to update this trend is to play with scale and supersize your beads. Does the need to sit around a fire outside go back to our days as cave-dwellers? Probably, but we have way better stuff to roast over the fire now, and beer to drink with it. Just like our pre-historic ancestors (except with access to hardware stores, and power tools, and computers), you can make your own DIY backyard fire ring with these tutorials on how to build a DIY fire pit. Colorful rope dog leads have been all the rage in the pet accessories world lately -- and I am obsessed! But, with prices ranging anywhere from $70 to over $150, they're a little outside most people's "dog stuff" budgets. If you'd still like to get your paws on a stylish leash for your pooch (in whatever color your heart desires) without breaking the bank, give this easy DIY rope leash project a whirl! You'll learn how to make a dog leash that perfectly fits your fido's taste (and yours!). Everybody loves IKEA, right? The simplicity of the designs, plus the sense of accomplishment from putting furniture together yourself... this combo makes IKEA a standard go-to when shopping for the home. There are lots of ways to hack IKEA furniture - however, would you like to customize these basic designs to set you apart from the thousands of other people that have the same piece? Turns out, it's a pretty easy transformation to make. Today we're taking a look at how easy it is to upgrade your IKEA furniture, thanks to Norse Interiors' system. You can style up a wide variety of IKEA furniture using prefab cabinet designs and knobs. Everybody will be asking, “Where did you get that?" Mirror, Mirror, On the Wall: Which is Our Favorite IKEA Hack of them All? Hanging a mirror is a painless way to add depth and interest to a wall. Mirrors reflect light and movement in a room, they're eye-catching, and they can make a space appear bigger than it is. If you know us here at Curbly, you know we LOVE a good IKEA hack. Today we're reflecting (sorry!) on some of our favorite IKEA mirror hacks and transformations, all in uniquely awesome ways. Keep reading! Can you believe it? Christmas is coming up quick! The holiday season always seems to whizz right by, doesn't it? If you're feeling like you've missed out on the festivities, don't fret - there's still enough time to make some last-minute baubles and bits. We've rounded up a few (well, not a few - over 150!) of our favorite DIY Christmas ornaments that you can definitely get finished this weekend, and enjoy for Christmases yet to come. Wintertime is in full swing here in Minnesota. Early in the week we experienced a few rounds of snow and ice, resulting in the outdoors being treacherous and uninviting. While I definitely have holiday-related errands to run this weekend, staying off the roads and keeping indoors is pretty tempting. I'm a homebody for certain, and I've learned how to keep the stir-crazies away during these colder months. Part of staying sane while being stuck inside has to do with how you light your home. Coziness is a must, and these DIY holiday luminaries are just that - cozy! Okay, so you have TONS of tutorials for Christmas stockings that you could tackle between now and Christmas, but you don't have a mantel on which to hang them. Not to worry! Santa doesn't really care where the stockings are hung (he has an uncanny ability to find them wherever they are). What I've heard is that he actually LIKES to find them hanging in less prosaic places. If true, these 10 Christmas stocking hanging ideas will surely please him.